Looks like Blue isn’t the only company getting in on the Flip camera microphone market. Scosche’s offering is quite a bit more advanced though, with wireless Bluetooth controls, a rechargeable lithium ion battery pack, and DSP noise cancellation. Scosche’s new freedomMIC plugs into the Flip UltraHD’s FlipPort, and will allow a user to have a microphone that works like a true wireless microphone system. To me, this significantly improves the usability of the Flip camcorders; we’ve never particularly cared for their audio quality. The freedomMIC will be available mid to late December, with an MSRP of $99.99. Not a bad deal. Oxnard, CA, – September 21, 2010 – Scosche Industries, an award-winning innovator of iPad, iPhone, iPod and now Flip video camera accessories, is proud to announce its first Designed for Flip certified product – freedomMIC™ lavaliere mic for the Flip UltraHD 2 HR/8 GB video camera. 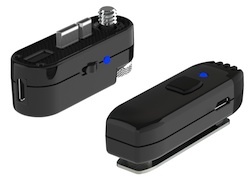 The Scosche freedomMIC receiver plugs directly into the UltraHD’s FlipPort™, which will come standard on all future flip video camera models, to provide users with the ability to wirelessly record high quality audio to accompany the Flip’s HD recording capabilities. Follow Scosche at twitter.com/scosche or facebook.com/scosche for the latest news on the freedomMIC and all of Scosche’s award-winning products.